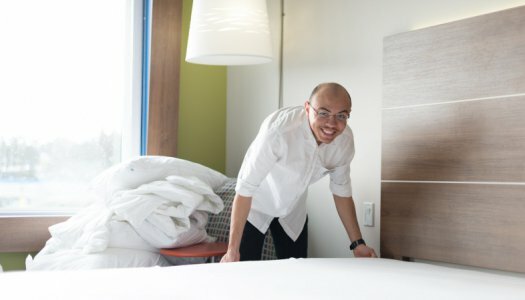 Muniz is one of 14 international students studying at Royal Roads University in Canada, who took part in a weeklong job shadowing program at the Holiday Inn Express Colwood, where they joined staff to learn every practical aspect of running a hotel. The program is a joint project between Royal Roads’ School of Tourism and Hospitality Management, International Hotel Group (IHG) and its training program, IHG Academy. The support of Holiday Inn Express Colwood owner Len Wansbrough and Royal Roads’ Office of Career Learning and Development were central to the project. Job shadowing is an example of the university’s Learning and Teaching Model in action says Assistant Prof. Alejandra Huerta Guerra, the program head for international pathway students joining the Bachelor of Arts in International Hotel Management and Bachelor of Arts in Global Tourism Management programs. Students worked with staff in housekeeping, maintenance, front desk and the hotel’s breakfast bar and adjacent restaurant; some students also spent time with the general manager. They took IHG Academy’s online training required of all hotel staff, as well as BC hospitality certifications such as Food Safe, Serving It Right and Super Host Foundations of Service Quality. Muniz agrees with his classmate that experience is vital to their learning. “In all departments, the needs of the guest come first,” says Muniz. He says he learned practical interpersonal skills from his time job shadowing at the front desk, especially when he met guests in town for a family emergency. “We have to tailor our service to each guest and their mood for the day, not to be overly excited sometimes,” he says. “We focus on making everyone feel welcome.” Interim general manager and guest service manager Teresa Hooper says the staff appreciated the students’ enthusiasm and hard work. She says this type of experience is essential when students apply for jobs in the industry. For the international students, job shadowing helped them discover areas where they may need practice in a second language, says student Lillyanne Liu. “For example, I loved speaking to people at the front desk and sharing laughter and smiles, but I found the phone challenging as many Canadians speak very fast on the phone,” Liu says.